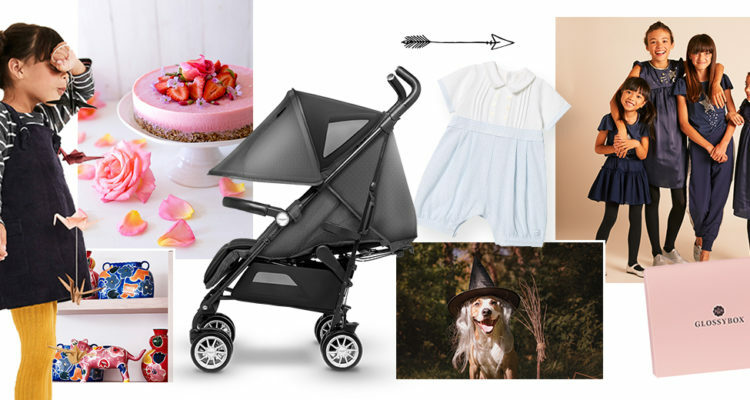 From kids’ fashion to the most luxurious pushchair and what’s on this autumn, here’s what the My Baba team are loving this week. Our weekly feature will highlight the best children and lifestyle brands to buy from right now and why we think they’re brilliant. Glossybox is the UK’s must-have beauty subscription. As if by magic, a beautiful new hand produced Glossybox arrives by post each month, packed full of five high quality beauty products. This month, Ellie unboxed September’s Back-To-School box and talked us through all the goodies inside. It isn’t just about the beauty bits each month, we’ve also picked up a few tips and tricks on how to best use the products: from how to create the perfect brow to making your lips look bigger, Glossybox have it covered. Womenswear brand Mint Velvet have taken a brilliant and exciting step into kidswear. The collection, called Mintie, is set to launch this autumn and will be a selection of mini-me pieces. We’ve been told to think ‘cute, stylish and modern’. Expect animal motifs, slogans and girl details. Kids’ fashion brand Wild & Gorgeous have designed a girls’ dress and top in aid of the NSPCC. All profits from both pieces, which make perfect party-wear, will be donated to the children’s charity. The glittering star design on the dress and t-shirt spearheads the NSPCC ‘Lighting up Christmas for Children’ campaign, which helps to give children the brighter future they deserve. Head to Hertfordshire to experience the spectacular autumn foliage this weekend. Children are encouraged to climb the trees, dive into giant piles of leaves and collect conkers and cones. What’s more, there’ll be pressing apples lessons to make your own apple juice and an elf-house making workshop. Sunday 23 September. It digests food, absorbs nutrients, and works closely with the immune system and brain. Looking after your family’s gut health should be at the top of your stay-healthy checklist. To keep things simple, here are four gut-friendly recipes for you and your family. With London Design Festival in full swing, we’re pitching up in Fitzrovia to enjoy a range of events and installations, and simply hang out in our favourite Charlotte Street eateries. The highlights: Arup will be exhibiting the Conflicts of an Urban Age; MOOOI are working with The Museum of Extinct Animals to honour the dodo and other extinct animals; and Heal’s have ongoing events, including Design a Michelin Plate Workshop, a public party celebrating Heal’s illustrious London history and a Design with Flowers Workshop. Don’t forget to check out the foodie offers for LDF visitors. Say hello to the latest Silver Cross collaboration with the iconic Aston Martin. Is this stroller the peak of pushchair luxury? We think it is. The wheels were inspired by the Aston Martin DB11, while luxury and comfort are synonymous with the Silver Cross brand. The pushchair is lightweight (55kg) and suitable from birth to 25kg. If this isn’t a first-class ride for baby, we don’t know what is. Emile et Rose is our new go-to for baby gifting. The Devon-based brand provide thoughtfully designed and complete outfits for babies. The collections are made up of pastel blues and pinks; the pieces are all super soft and super comfortable. The AW18 collection features some lovely floral prints and some deep red pieces which are getting us all thinking about Christmas!